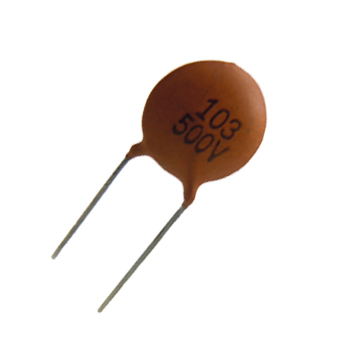 capacitor is a passive electronic component that storesenergy in theform of an electrostatic field. thedielectric constant of the substance separating the plates. are the microfarad, abbreviated μF (1 μF =10-6F) and the picofarad, abbreviated pF (1 pF = 10-12 F). recharged thousands of times per second or theDRAM willlose its data. Ceramic capacitors are constructed with materials such as titanium acid barium used as the dielectric.Ceramic capacitors are normally used for radio frequency and some audio applications. Internally, these capacitors are not constructed as a coil, so they can be used in high frequency applications. Typically, they are used in circuits which bypass high frequency signals to ground.These capacitors have the shape of a disk. Their capacitance is comparatively small. 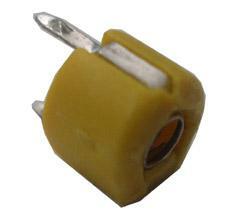 Grace is glad to ask if you are looking for Ceramic Capacitors. Elecsound is a manufacturer and very speciallized in ceramic capacitors. We offer high quality with competitive prices, lead free and speedy delivery in 3–5 days. If you are interested in any kinds of them,please email to me,I will quote our favorable prices to you. Looking forward to your inquiries & Have a nice weekend. Would you please check if you need chip ceramic capacitors? Elecsound can offer you very attractive price and good quality. For small qty and standard items, we usually have stock on hand. For some unusual items which no stock. lead time is only 7–10 working days. could you pls check if you have such inquiry to me? Offer 0402, 0603, 0805, 1206 case.16V, 25V and 50V. 0.015uF 250v 1206 X7R 10% Price; USD19/kpcs only. If you want to know more about our attractive price. welcome to send me email. usually have stock on hand. For some unusual items which no stock. lead time is only 7–10 working days. could you pls check if you have such inquiry to me?